Protein is a vital part of any diet. It helps keep you full, provides the necessary nutrition to your muscles, and contributes to healthy skin, hair, and nails. Traditional meat and poultry isn’t the only way you can get the protein you need, though. There are tons of high-protein snacks out there to keep you satiated between meals or when you’re in a pinch. 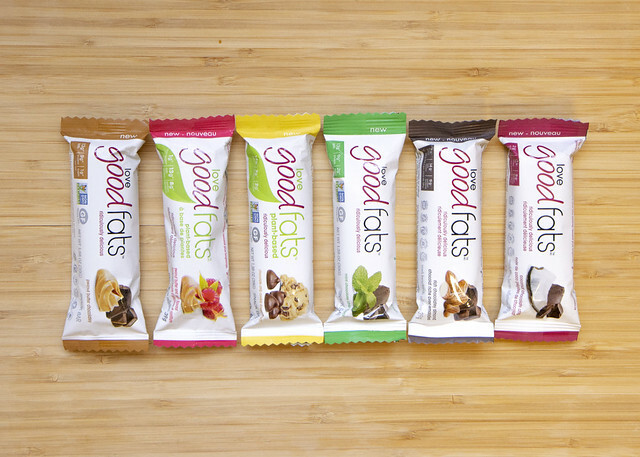 The tagline on these tasty Love Good Fats Bars is "fat is back." And with that sentiment, it shouldn't come as a surprise that these easily portable snacks are Keto-approved. They come in an array of flavors, but none of them ever has more than 2 grams of sugar. Most have 9g of protein (except the chocolate chip cookie dough flavor), and their healthy fat content will help you fill fuller for longer. It makes them perfect for an on-the-go lunch snack or a quick bite in between back-to-back meetings. We can't agree on much in our office, but the one thing we do agree on is how good ONE Bars are. 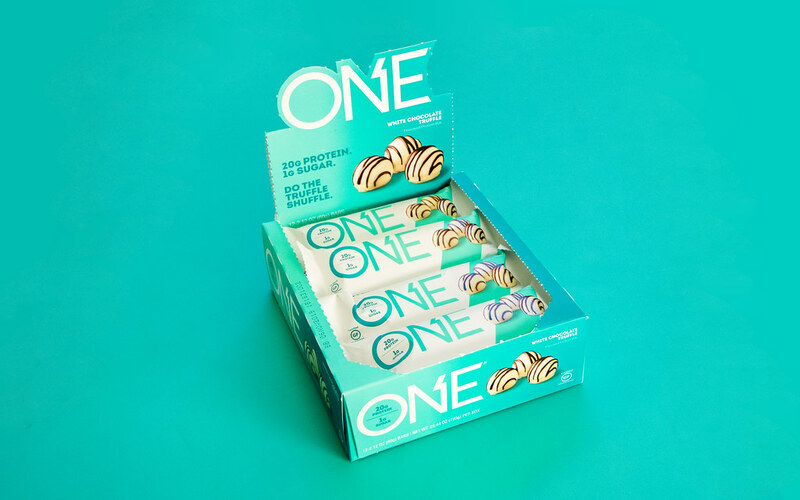 Whether you're looking for a protein pick-me-up before or after going to the gym or just simply wanting something that's filling for one of those tedious meetings that run over your lunchtime, ONE Bars have a flavor that you will love. They are all decadent, like a sweet treat or a dessert, but they only have a single gram of sugar. The new white chocolate truffle flavor had us doing the truffle shuffle well past our usual 2: 00-afternoon slump. Beef jerky is, obviously, one of the first things that comes to mind when thinking of on-the-go snacks, especially when hiking or camping. It's easily portable, lightweight, and doesn't spoil. Plus, it provides much-need protein to keep your energy up throughout a day's worth of active action. If you reach for a flavored offering like teriyaki, however, there is often a high amount of sugar content. 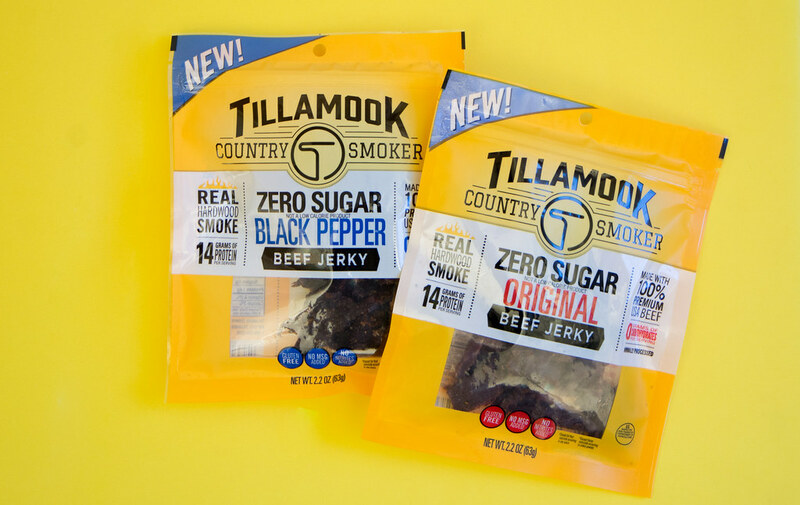 Tillamook Country Smoker's Zero Sugar Beef Jerky gives you full flavor, 14g of protein, and NONE of the sugar per serving! That's right! Zero grams. 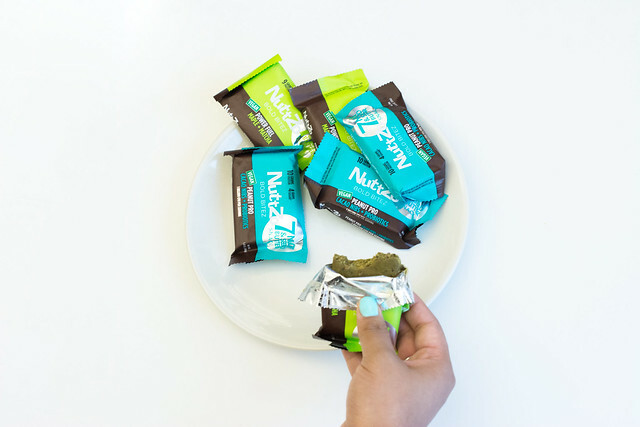 NuttZo's Bold Bitez are the perfect on-the-go option for vegans because of the snack's plant-based protein. Even better, the bites are dairy- and why-free. Additionally, those tasty 10 grams of protein don't come at a high sugar cost. There are only 4 grams of sugar in these squares! The peanut + cacao nibs + probiotics flavor were our favorite on a particularly grueling morning of errands, allowing us to maintain a healthy energy boost until a late lunch. They were also much appreciated on our hours-long road trip to the beach, saving us time (and calories!) from stopping at the many fast food joints dotting the highway. There are tons of protein drinks on the market, but few cater to the vegan and dairy-free crowds. Califia Farms is known for their creamy and delicious nut milk, but they’ve also added protein-enhanced almond milk choices. 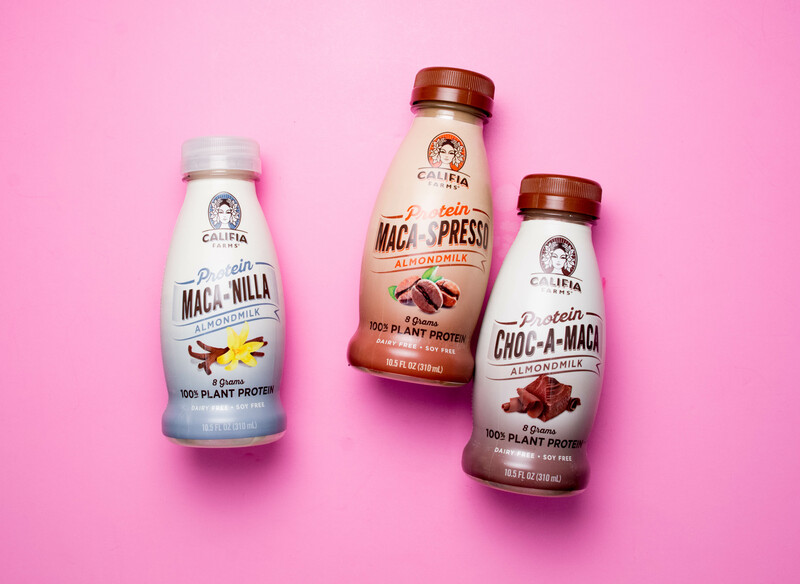 They make three flavors: Choc-a-maca, Maca-’nilla, and Maca-’spresso. 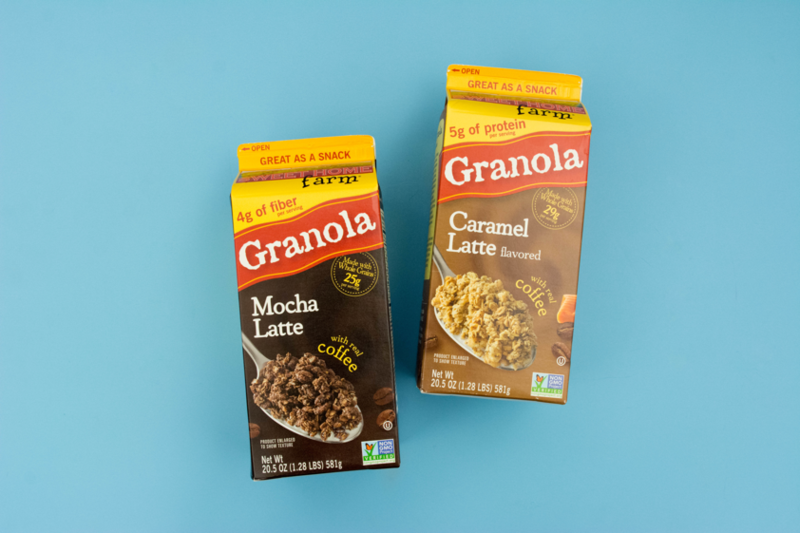 All three offerings are soy-, carrageenan-, BPA-, gluten-, and dairy-free milk that just so happen to be vegan and kosher. On top of all that, they provide 8 grams of protein from peas and brown rice. They make an excellent addition to your breakfast and are extra convenient on-the-go snacks. Protein-full breakfasts are just as important as other meals. If breakfast meats aren’t calling your name, you can still get a good serving of protein with the right granola. Sweet Home Farm's 6 flavors of granola are high in protein, pair well with your favorite fruits or milk, and are super easy to prepare when you’re short on time in the morning. They have French Vanilla, Blueberry Flax, Maple Pecan, Cinnamon Raisin, Pumpkin Flax, and Honey Nut. These flavors contain between 4-6 grams of protein per serving, plus they’re non-GMO certified while being full of healthy fiber. Pork Rinds get a bad rap, but the truth is they can actually be a good snack option if prepared properly and made of the highest-quality ingredients. 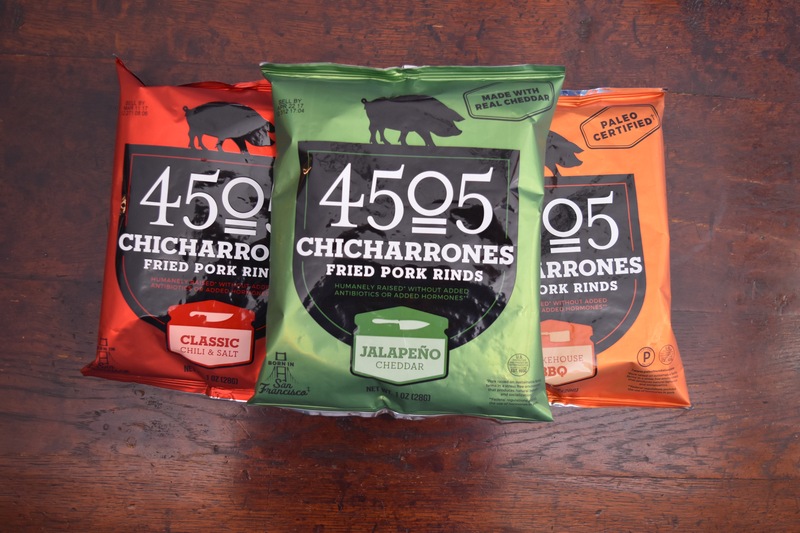 4505 Chicharrones pork rinds are made with the high-quality pigskin and fried in lard, so they minimize waste in the process. Before you freak about the fact they’re fried in lard, remember that all pork rinds are fried in either lard or oil. These might be higher in saturated fat than other snacks, but they are also much higher in protein. 4505 Chicharrones average 8 grams of protein per serving. If you’re looking for something tasty that will pack a hefty protein punch, then 4505 has you covered. Jerky is such a convenient snack, and if you choose the brand wisely, it can also be extremely healthy for you. Krave Jerky is gluten free, low fat, and made from 100% lean cuts of meat. It’s also packed with protein, which helps rebuild muscles after exercise, contributes to strong hair and nails, and helps keep you full. Krave’s new jerky sticks and bars are even easier high-protein snacks since they come individually packed and are easier to grab on the go. The Krave Sticks come in three flavors: spicy red pepper pork, sesame garlic beef, and rosemary lemon turkey. These average 90 calories and 7 grams of protein per stick. 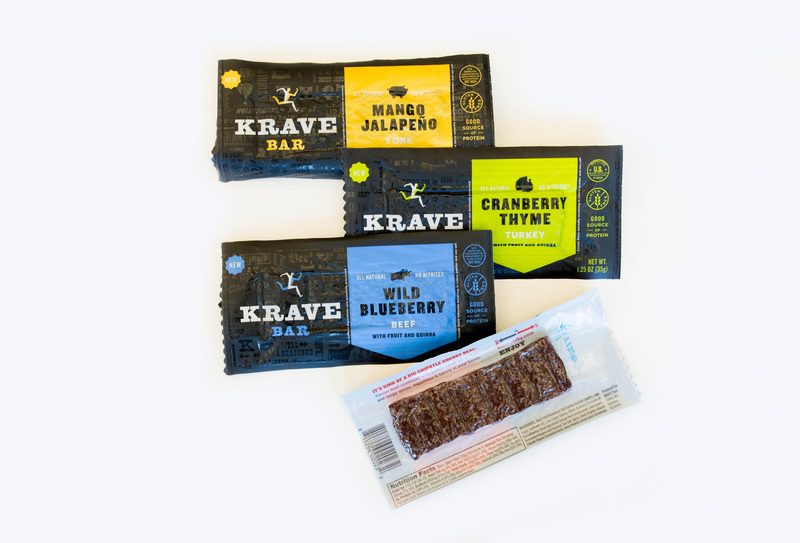 The Krave Bars come in four flavors: chipotle cherry beef, mango jalapeno pork, wild blueberry beef, and cranberry thyme turkey. The bars average 8 grams of protein and 112 calories. 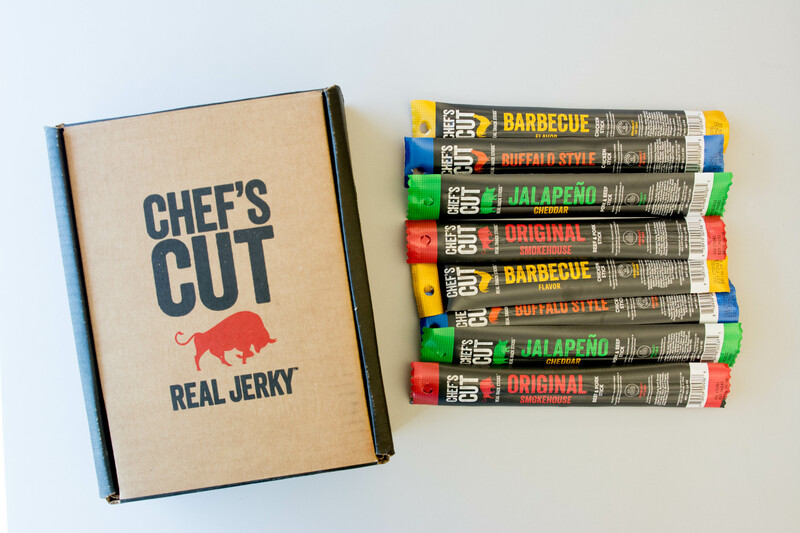 Chef’s Cut is another high-quality jerky brand. In contrast to Krave, the flavors from Chef’s Cut are more traditional. They offer jerky from beef, turkey, and pork, but they also have chicken and even bacon(!!!). The original recipe from Chef’s Cut contains 12 grams of protein in one serving, and it only has 100 calories. 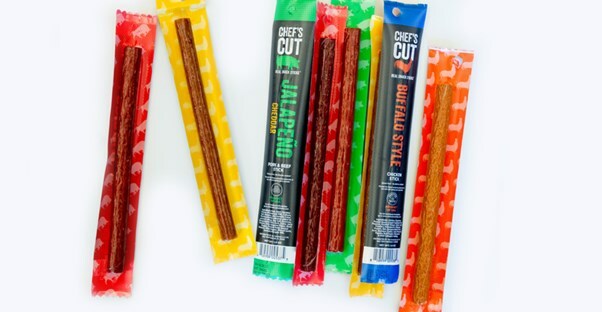 Chef’s Cut offers 9 different types and flavors of jerky in their multi-serving bags plus four different flavors in their jerky sticks. There’s definitely bound to be a flavor that appeals to you.